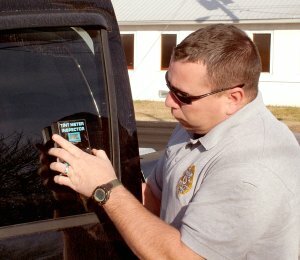 This blog is intended to help simplify the laws in North Carolina regulating window tint on motor vehicles. First, since windshields are ALL the same regardless of the type of vehicle we’ll cover it first. No windshields can be tinted below the AS1 line, or 5 inches down from the top edge to less than 32% . Most windshields already have some type of tinting in that 5 inch area, and you can add additional tinting is desired. However the tint cannot exceed 32% light transmission when tested with an approved device. Light trucks, Vans and SUV’s are allowed to have windows tinted below 32% light transmission except for windshield, drivers and front passengers windows. Those 3 windows can’t be below 32%. Passenger cars are a little different because no windows are allowed to be tinted below 32%.